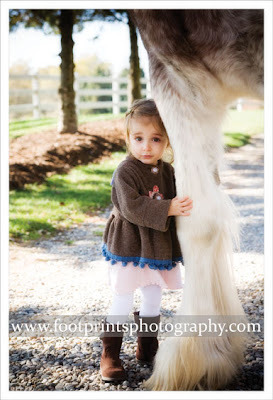 Ellie is a gorgeous 18.2 Strawberry Roan Clydesdale Mare. Some of you saw her when you were at my house in the spring. She is a gentle giant. I love to just lay on her and hug her and feel her sweetness. We went out to her new farm to get a few pictures I wanted. Her mom did this for me and I am so thankful, they are images I wanted to capture from the beginning. Don't worry, Ellie is very, very careful with her feet. Ellie loves children if you can't tell. I thought this was funny as well. 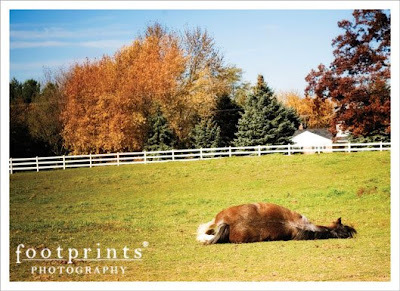 Ellie was just exhausted, modeling is not as easy as it looks! These pictures are amazing. I love the first one. There is such gentleness in it! Thank you Lori, I loved Ellie so much. And you pegged her, a gentle giant. Poor Ellie colicked a few weeks ago and her stomach twisted. She unfortunately didn't make it. We are all very sad and her poor family is devastated. Ellie will be greatly missed. I appreciate your comments. Absolutely Beautiful! You just broke my heart. You are a very talented photographer! Ooh...I really like the composition and perspective of the 2nd one. omg...how beautiful! 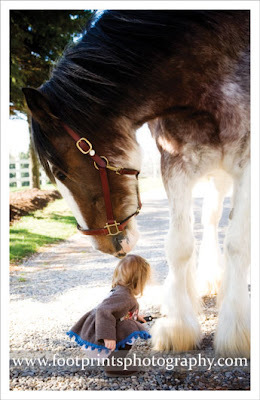 I love the gentleness of these images!